Athletic performance can vary over the course of the day by up to 26%, depending on the athlete’s circadian rhythm, according to research published in the journal Current Biology. The study illustrates how important it is for athletes to be aware of their sleep cycle and leave time to adjust when travelling to another country to compete. Circadian rhythms are internal cycles of around 24 hours that regulate various behavioural and physiological systems in the body. Different systems peak at different times of day so some people naturally prefer to be active earlier, while others are happier being active later. Sleep scientists call this your circadian phenotype. “The key finding from this paper is that your circadian phenotype is important in determining the best time of performance for you,” said Shantha Rajaratnam, professor in psychology and sleep researcher at Monash University. Professor Rajaratnam added that circadian types were partly influenced by the way we’re genetically wired, and partly by lifestyle and behavioural habits. In particular, our light-dark exposure plays an important role. In the study, 20 athletes of similar age and fitness levels were selected to take part in a cardiovascular endurance test at six different times of the day. The participants represented the population levels of early (28%), intermediate (48%) and late (24%) circadian types. Early phenotypes performed best in the earlier tests, followed by intermediates, and the late types peaked in the evening. Early and intermediate types had a 7% to 10% variation in their physical performance over the course of the day, but late types varied by up to 26%. The study found the biggest factor in predicting performance was the time since when your body would naturally wake up. Sports coaches seem to be realising the competitive edge that might be gained by working with athletes&apos; circadian rhythm. Professor Leon Lack from Flinders University worked with the Socceroos in the lead up to the 2006 World Cup. Flying in from their last game in South America, the team had only a few days to adjust for their evening qualifying match in Sydney in 2005. Dr Lack consulted with the team’s doctor to create a sleeping and light exposure plan for the players to expedite this process. 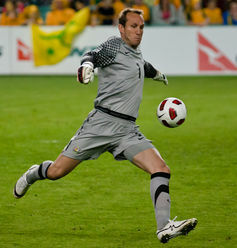 The Australian team went on to win in a memorable penalty shootout, with several saves made by Australian goalie, Mark Schwarzer. “The team doctor discussed this with me afterwards and said that Mark Schwarzer was probably the most conscientious about keeping to the routine,” Professor Lack said. Craig Duncan, senior lecturer at Australian Catholic University, is currently working with the national soccer team as the head of sport science for the Asian Cup. Disruptions to sleep affect the internal body clock. According to Professor Rajaratnam, the general consensus for adjusting to a new timezone is around one day per hour of time difference, although that can be achieved faster with increased light exposure at the appropriate times of day and light avoidance at other times. For would-be athletes who struggle to make it to training in the morning, the key is adjusting activity and light exposure.